Homepage. This page: A look at motoring regulations back in 1963. 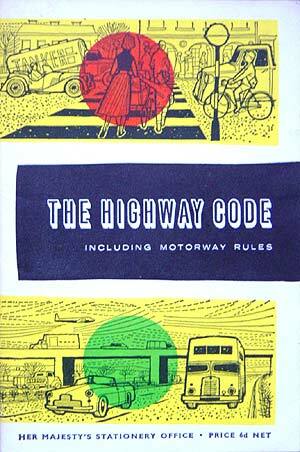 I've got a few old copies of the Highway Code from different dates scattered about the place, this one, which was a revised edition of the Code published in 1963, is perhaps the most colourful in the use of artwork on the cover. The Highway Code is issued to drivers in the UK, and contains information on the rules and regulations of the road. Mention is also given on the cover to the new fangled motorways, that were still a recent invention for the UK motorist. Anyone with a licence could now pull off a bumpy A road, straight onto the new super-fast highways, and do battle with high speed traffic for the first time. To help educate the more hapless motorists out there, the Highway Code tried to impress certain new rules via its pages. Reading this publication now, perhaps the most interesting regulation is on the very last page, which, under section heading Motorways, advises that 'There is no speed limit except for one of 40mph for motor vehicles drawing a trailer (excluding articulated vehicles) if the trailer has less than four wheels or is a close-coupled four-wheeled trailer.' So, back in 1963, no speed limits on the motorway. On the face of it, it sounds like a great time to be let loose on the quiet new M-ways, no annoying restrictions and so on. However if you were about to take your shiny new E-Type out on the Preston by-pass (the first section of motorway in the UK, opened in December 1958, and labelled the M6), you'd have to keep an eye out for some very shaky drivers who perhaps shouldn't be there at all. Wobbly old Ford Pops piloted by drivers who themselves pre-dated the motorcar, the mum and dad who decide to park up on the hard shoulder for a cup of tea and egg sandwich, and the bicyclist who decides to take a short-cut across all the carriageways. Motorways have always had their hazards, but in the early days they must have been far more varied than now. Today, most dodgy drivers you spot are either tail-gaters, busy texting on their phones, or tidying up their lipstick while piling along the outside lane at 95. In December 1965 a temporary speed limit of 70mph was introduced, following some grim smashes on the still-new motorway network. This temporary measure, introduced by a Roads Minister who didn't actually drive herself, is still in place, some 40+ years later. This limit was dreamt up when most cars still tottered around on crossply tyres, relied on drum brakes, had little in the way of safety equipment, with drivers who may never have even taken a test at all. Many would argue that it is time for a review to be made of motorway speed limits, given the epic increases in car and road safety technology that has taken place since the mid 60s. Flexible speed limits are used to slow traffic when the conditions dictate that this is a good idea, such as through roadworks, and instances of heavy rain and fog. In the same spirit, it wouldn't seem unreasonable to consider flexing the limit upwards at times of low traffic density and good conditions, perhaps overnight. Whether any government would ever do this though is open to debate!! Chances are, things will continue to be tuned as always to the lowest common denominator on our roads, which could be the ancient motorist with failing eyesight, or the pierced 17 year old chav in his lowered Vauxhall Nova. The Transport Research Laboratory website can be an interesting read on transport & road design. As well as pointers for safe four wheeled progress, the pedal- and motor-assisted cyclists also get a mention. Rules such as 'If there is an adequate cycle track, use it' and 'Ride in single file when road or traffic conditions require it, and never more than two abreast' make as much sense now, as they did when The Beatles still had short hair. In fact there are plenty of cyclists around now that could do with brushing up on their Highway Code, just as much as many drivers could do. Something that has all but disappeared from use in modern day motoring is the art of the hand signal. Hand gestures are usually reserved now for the use of rep drivers, white van man, and anyone who feels aggrieved by the actions of another, and involve the waving or either a single or pair of digits out of the window, aimed at the other driver/pedestrian/cyclist (delete as applicable). At one time the hand signal was reserved for advising others of a direction change, perhaps to suppliment the old pop-up semaphore indicators that weren't always too visible, or by a cyclist who wanted to dive down a side road. In fact the latter bunch of road users, often decked out in lurid figure hugging cycling clothes, are perhaps the largest users of hand signals now. I can't remember the last time I saw a driver wave his hand in a circular manner out of the window, to indicate that he intended to pull in, or turn to the left. There are quite a few illustrations in the 1963 publication of the Code, my favourites are the old-style road signs (some of which can be seen on the old road signs page in the vintage cars section). These signs are very collectable nowadays, most now being in the hands of collectors, with very few still in their original location.